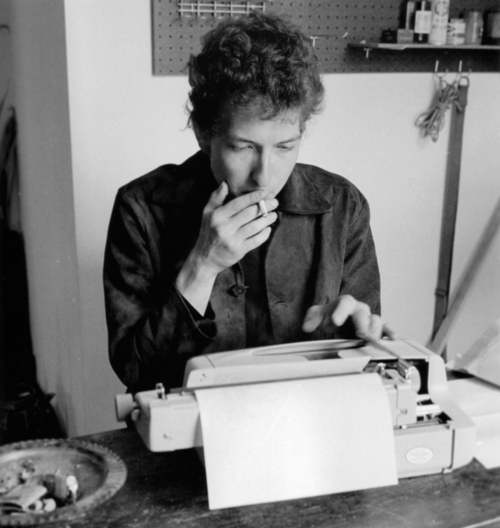 Dylan at 24, on Ginsberg’s typewriter. Happy birthday to a great American poet. I wish I time for more than just providing a few links, but there will be no shortage of Dylan commentary today. Here are a few Dylan-related things we’ve done over the last few years: A post noting the death of William Zantzinger; a pointer toward my thoughts on Todd Haynes’s I’m Not There. I thought I had posted about the New York Times discussion in December 1965 of whether Dylan was America’s Public writer no. 1? [subs req], but I guess I never managed to. Some stuff on the Web and around town in honor of this auspicious occasion: Rolling Stone has a bundle of goodies, including Rob Sheffield’s list of overlooked classics; HuffPo readers are compiling their favorite tunes as a digital birthday card; Radio Free Europe is playing Dylan in multiple languages; WBAI will air 23 hours of Dylan material, including rare recordings; Film Forum is screening two classic films this week.